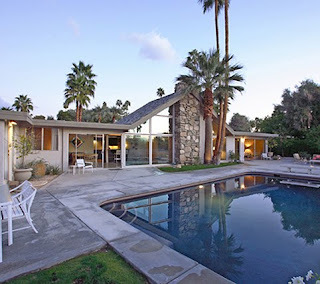 This is perhaps the most stunning of the fifteen so-called "Swiss Miss" houses on the Las Palmas Estates in Palm Springs. 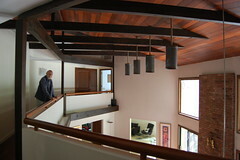 Designed by Charles Dubois, and built by Alexander Construction in 1959, these alpine chalet inspired homes are quite distinct from the standard Alexander-built tract houses, most of which were designed by William Krisel. This one was completely renovated in 2005 and is currently for sale at $1,095,000. 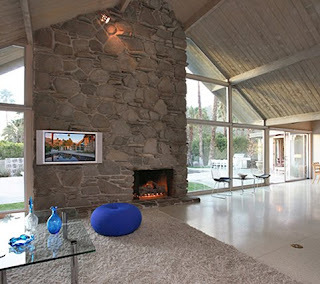 There is also an option to rent at $595 a night or $3,195 a week through Vacation Palm Springs . Gawd I love that house. If all the bloginas chipped in, we could have one helluva weekend at that house.